Dry lakes are places in the desert where drainage stops, and goes no further. Landscape dead-ends, they attract activities drawn to nowheres. Many dry lakes have no name, marked on maps only as alkali flat, salt flat, sink, mudflat, wash, or playa (if at all). A current exhibit in Los Angeles looks at approx. 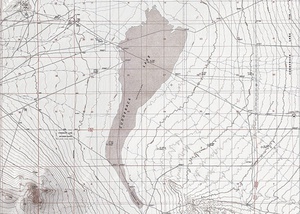 70 dry lakes in the Mojave valued enough to have names and be recorded on maps by the US Geological Survey. These are the nowheres that have become, at the very least, somewhere. Leave it to The Center for Land Use Interpretation (CLUI) to curate such a creative and interesting show. A research and education organization, CLUI is dedicated to the increase and diffusion of knowledge about how the nation's lands are apportioned, used, and perceived. They find new meanings in the intentional and incidental landforms we individually and collectively create, and believe that the manmade landscape is a cultural inscription, which can be read as insight into who we are and what we do.